This print "...was probably issued during Shigeharu's years of highest productivity across 1829 and 1830. The paragons of filial piety are Chinese legendary or historical figures noted for their proven devotion to their parents. The concept of such obedience to one's parents guaranteed the continuation of the family system as well as providing the basis for the larger Confucian social system. These subjects are frequently illustrated by Japanese print artists, but this may be the only set by an Ōsaka artist. While the printing is quite delicate and clear, it is also relatively simple. 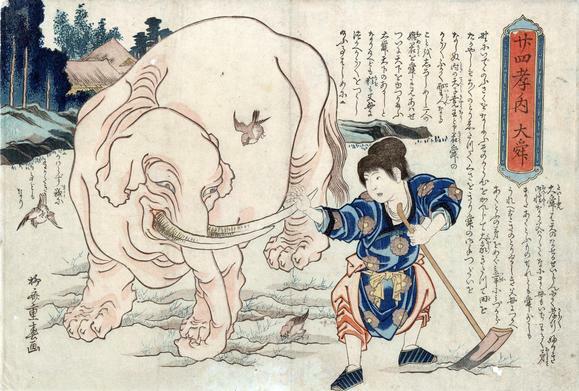 Away from the conventions imposed by the theater print and within the realm of Chinese tales, the artist used a style reminiscent of Hokusai or Kuniyoshi, and many of the designs are quite ingenious." Quoted from: Osaka Prints by Dean Schwaab, p. 246. Schwaab continues on page 247 specifically about the print in the Lyon Collection: "As a boy Taishun suffered the vagaries of a difficult blind father, as well as a pitiless stepmother and half-brother. When he was still a young boy, his parents demanded that he cultivate a very large area of land. Uncompromising, he did so, aided in his task by an elephant of the Emperor Yao - the semi-mythical founder of China - who, hearing of his remarkable filial piety, gave him his daughter in marriage and appointed him successor to the throne." There is another copy of this print in the Osaka Art Museum. The National Library of Australia notes: "The print sets depict scenes from the famous stories of China, the Twenty-four Filial Exemplars, also translated as Filial Piety. This is a classic text of Confucian filial piety written by Guō Jūjìng, a scholar of the Yuan dynasty (1260–1368). The text was extremely influential in the medieval Far East and was used to teach Confucian moral values."